In Italy, I’ve been cooking a lot more than other places. The best part is that I’m actually learning how to cook better which was one of my goals for this trip. So, for Devon’s birthday I set out to cook him a scrumptious meal. He wasn’t in the mood for a pasta with tomato sauce because we’d had a lot of that. 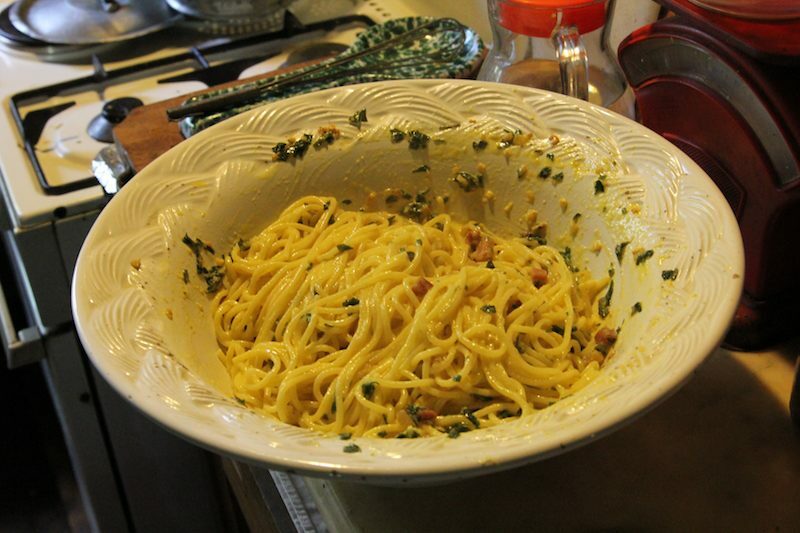 He wanted carbonara instead – a pasta with an egg sauce. He told me, the trick is to take the pasta out of the water before you think it’s ready. When you cook pasta you normally taste is until you think it’s soft enough to plate. In Italy that’s too late. You should actually take it out while it’s still a little on the hard side, just a little harder than you’d want it in the meal. The reason for this? The pasta continues to cook in the hot water while you get your colander ready, it cooks in the colander while it’s draining and it cooks in the bowl while you’re mixing it with the sauce. By the time it hits the table, it’s perfect. Sounds scrumptious and wow! you impressed an Italian with your pasta cooking skill. That’s a big deal! Sadly, I think there’s going to be a lot less carbonara eaten in America in the near future. Over a million salmonella laced eggs have been recalled. Oh, FDA, where are you when a big business is in violation? Oh, small farms, how I love thee. Devon is a lucky man!